During renovations at the former site of a medieval church in London, England, construction workers uncovered the entranceway to a hidden crypt. Inside lay 30 lead coffins, including the remains of five former Archbishops of Canterbury. It’s a completely unexpected archaeological finding—showing that even London’s most famous historical sites still have secrets to tell. The discovery was made at Lambeth Palace’s Garden Museum, the prior home of the Church of St. Mary’s-at-Lambeth. This medieval church was built in the 11th century, and for years was located next to the Archbishop of Canterbury residence (the Archbishop of Canterbury is the senior bishop and principal leader of the Church of England, and the symbolic head of the Anglican Church). Over the centuries, many archbishops worshipped at the church, and as this latest archaeological discovery shows, many of them also chose to be buried there. The historic church, which was converted into a museum in the 1960s, is currently undergoing an extensive 18-month-long renovation. Given the building’s history and its proximity to the river Thames, the work crews had no reason to believe that anything existed below the structure. It was assumed that the lower levels had been filled with dirt as a precaution against flooding. As part of the renovations, workers had to lift large, heavy flagstones to expose the ground underneath. These stones—some of which weighed as much as 3,300 pounds—were laid down in 1851. The removal of one of these stones revealed a hidden entrance to unknown space directly below. The workers hastily attached a flashlight and a camera to a stick and stuck it in. To their utter astonishment, the footage showed a secret tomb with numerous coffins stacked upon one another. 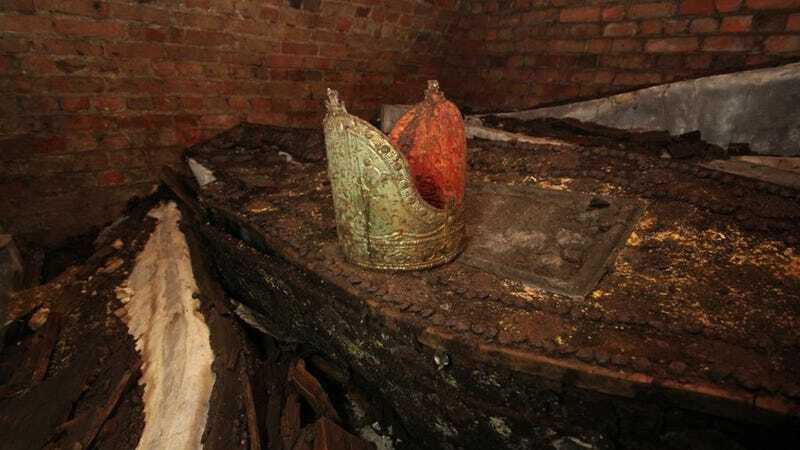 Incredibly, one of these coffins had a gold crown on top of it—a Mitre signifying the buried remains of an archbishop. Several coffins had nameplates on them—including five coffins that hold the remains of prior Archbishops of Canterbury. Of note is Richard Bancroft, the Archbishop of Canterbury from 1604 to 1610. He chaired the committee that wrote the King James Bible, which is considered the most notable and “majestic” English translation of the Bible. The crypt also contains the remains of John Moore, Archbishop from 1783 to 1805 (and his wife Catherine Moore), Frederick Cornwallis (in office 1768-1783), Matthew Hutton (1757-1758), and Thomas Tenison (1695-1715). The 30 lead coffins have been left undisturbed, so we may never know the identity of the dozens who remain unidentified. Still, the discovery of five “lost” archbishops—including the person who commissioned the King James Bible—at such a highly celebrated and well studied site is nothing short of remarkable; unearthing a secret tomb isn’t something that happens every day. The builders have constructed a glass panel in the floor above the crypt so visitors can take a look below. The Garden Museum is scheduled to reopen in May.